Strings must be in good condition in order for the regulation to be worthwhile, as often regulation problems occur because of old/faulty strings. Strings need to be replaced every one to five years, depending on the climate, usage, and desired quality of sound. Don�t ruin new strings by putting them on wrong, ask for tips/help. Regulation typically takes a few hours. For your convenience you can leave the harp in the studio for those few hours or for a few days. Replacing a whole set of strings takes three to five days. Replacing wire strings can be done during regulation. I can help you transport the harp if you do not own a big enough vehicle. Q: Why do harps need to be regulated? A: Like tuning a piano, a harp needs to be regulated every couple of years to maintain the instrument and prevent problems from developing. However, regulation requires more technical work then simply tuning the instrument. 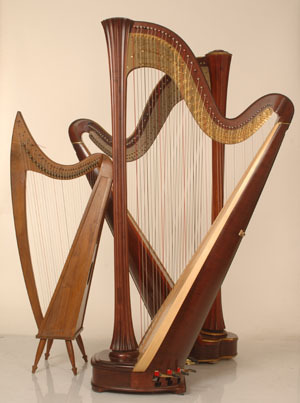 The harp is comprised of different types of wood and nearly two thousand metal parts which make up the pedal mechanism. This massive metal structure is attached to the curved neck of the harp. Together with the stretched strings, this applies immense tension to the wooden frame. Over time, the wood will continue to adjust to tension, causing changes in the harp's regulation. Q: What factors determine how soon regulation is due? Q: What areas are targeted in a regulation session? Q: Where did you learn to regulate harps? A: I completed all my higher education at Indiana University, Bloomington, including a class on harp regulation with a Lyon & Healy trained specialist. Since then I have been regulating school harps, my own harps, colleague's harps, and client's harps in the United States and back in my home country of Israel. Q: How long does a regulation session last? A: Regulation typically takes a few hours. For your convenience, you may leave the harp at my studio for the duration of the session. Replacing a whole set of strings takes three to five days, while replacing wire strings can be done during the regulation session. I can help you transport the harp if you do not have a suitable vehicle. If your home is located in a place that makes it difficult to transport the harp, I will make the trip for a nominal charge. However, it is always preferable to have the harp brought to my studio. Q: Why do strings need to be changed before regulation? A: Strings must be in good condition in order for the regulation to be worthwhile, as regulation problems can occur because of old or faulty strings. Strings need to be replaced every one to five years, depending on the climate, usage, and desired quality of sound. Don't ruin new strings by putting them on the wrong way! Feel free to contact me for installation help. Q: How does one know if the strings are still good? A: If you have not replaced your strings in the last five years, you are overdue for a new set of strings. The upper two octaves have to be changed every two years. Your string selection is dependent on your local climate and desired sound. A good indication for old nylon strings are indents that occur where the discs touch the strings or false sound. For old gut strings the indication is a yellow shade and a rough feeling when running two fingers down a string. Typically, the top one or two octaves are nylon, middle octaves are gut, and bass strings are tarnish-resistant wire strings. For a more durable alternative to the very expensive gut strings, especially for very dry climates, Savarez (synthetic gut) strings are a decent option. Please ask me for more details. Q: How are strings replaced? A: You don't want to ruin new strings by putting them on wrong! If you don't know the proper method, I can change them before regulation. If you plan to install a full set of new strings, please do it at least two weeks before your scheduled regulation. Also do not change all your strings in one session, as this can drastically increase the tension on the wooden structure. Replacing a whole set takes a few days, but replacement of wire strings can be done during the regulation session. Strings will need to stretch for a week or two before regulation can be done. Q: What can be done to take better care of a harp? A: -It is very important to keep a constant and healthy humidity and temperature level in the room. A humidifier and a humidity gauge are a must in the harp room, with the humidity level maintained at 45-55% year round. Whatever the humidity level is set to, it is important to keep it consistent. -Always put your pedals in the "flats" position at the end of a practice session. The strings will wear out faster at the contact point of the discs if you forget to do so, accelerating string wear. -In the event you have to take the harp outside, always have a complete transport cover on it (including base cover), especially in the winter when the drastic temperature change can damage the harp. When you transport the harp, always make sure the exposed disc/lever mechanism on the harp's neck is facing UP in order to avoid putting unnecessary pressure on this sensitive part. -Know the people who are moving your harp, and do not be afraid to say "No! Thank you, but this is not the way to move it." Every little slip or drop of the harp can seriously damage the regulation and overall condition of the instrument. -If you are not sure about how to do something, ask for professional advice. It is better to be sure then to make a bad assumption.